Borycki, E.M., Kushniruk, A.W., Kuziemsky, C.E., Nøhr, C.
Context is key in the design, implementation and evaluation of health information technology. Healthcare systems around the world are in transition; adopting technologies to deal with the problems of aging populations, increased numbers of chronically ill patients and limited resources. But a 'one size fits all' approach is not the answer, and may limit those local healthcare system innovations that are so crucial to the development of health informatics. Even the most advanced systems will fail to achieve the desired outcomes if context is not taken into account. This book presents the proceedings of the Context Sensitive Health Informatics (CSHI) conference, held in Curitiba, Brazil, in August 2015. 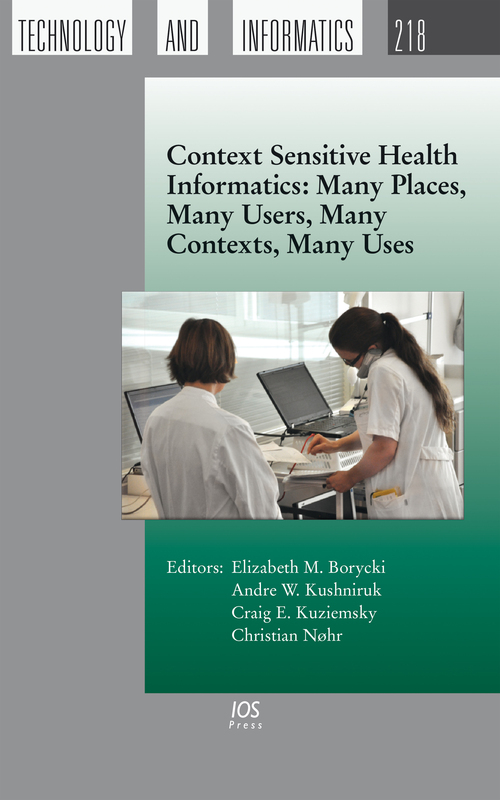 Context sensitive health informatics is about health information technologies and their environments, and the 26 papers included here examine how health informatics systems are developed, implemented and evaluated in a complex environment of many places, many users, many uses and in many contexts. The book is divided into four themes: different users in different contexts; evaluating for context through usability testing and ensuring patient safety; organizational and social issues in different places; and understanding different contexts using theory. This overview of the research and experience critical to ensuring the successful introduction and adaptation of healthcare systems to new countries, contexts and healthcare settings will be of interest to all those involved in improving the quality of healthcare worldwide.